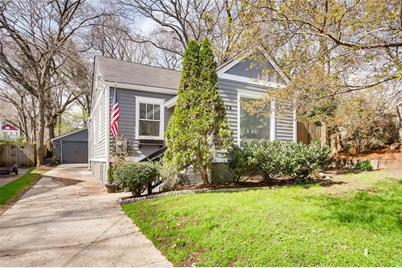 Meticulously maintained in the Heart of EAV walking distance to the Village! Recent energy-efficient upgrades: New HVAC, water heater, Smooth Hardiplank siding, exterior wall insulation w/house wrap, double insulated wood windows, new gutters, new exterior & interior paint. Hardwood floors throughout. True master w/renovated master bath. Large entry foyer could be used as flexible space/office. Newly updated kitchen features eat-in area, granite counters, and newer appliances. RARE FIND-super deep, privacy fenced lot. 1 car garage for parking or for a workshop/storage. Driving Directions: From Midtown (or 20), take Moreland S , left on Metropolitan, left on E Side. Home is on the left. or from the village head East on Glenwood and take a left on E. Side. Home will be down on the left before Mcpherson. 373 E Side Avenue SE, Atlanta, GA 30316 (MLS# 6513811) is a Single Family property with 2 bedrooms and 2 full bathrooms. 373 E Side Avenue SE is currently listed for $389,000 and was received on March 06, 2019. Want to learn more about 373 E Side Avenue SE? Do you have questions about finding other Single Family real estate for sale in Atlanta? You can browse all Atlanta real estate or contact a Coldwell Banker agent to request more information.